Around noon on Oct. 4, 2017, a team of 12 U.S. Army Special Forces operators and 30 soldiers from the Nigerien Security and Intelligence Battalion were departing the village of Tongo Tongo, near the Nigerien-Malian border, when they were ambushed by roughly 50 insurgents from an “ISIS-affiliated group” riding in a dozen technicals—pickup trucks armed with heavy machine guns, mortars, rocket-propelled grenades and small arms. According to an Oct. 23 briefing by the chairman of the U.S. Joint Chiefs of Staff, General Joseph Dunford, the U.S. military didn’t record the Green Berets requesting air support until an hour after the ambush began. Once the request was received, two French Mirage 2000 fighters based at Diori Hamani Airport in the Nigerien capital of Niamey scrambled within 30 minutes, according to a statement by the French military. It took them another half hour to arrive over the battlefield, around 110 miles to the north. The fighter jets’ intervention was decisive—even though the Mirages never fired a shot. The French military stated that the pilots couldn’t drop bombs due to the ambushers’ close proximity to friendly forces. It’s possible that the troops on the ground lacked the means to paint a target for the aircraft to destroy, the communication links to coordinate an attack or eligible targets that were ‘t prohibitively close to friendly forces. Instead, the French jets performed a “show of force”—the French-language statement actually spells out the term in English—buzzing low over the insurgent technicals. The intimidation tactic worked — and compelled the enemy forces to withdraw. French, Nigerien and American forces remained active around the site of the ambush for two more days searching for a missing Green Beret, Sgt. La David Johnson, who was found dead a mile away from the main site of the engagement on the evening of Oct. 6, bring total losses to four American and five Nigerien troops killed in action. A senior Pentagon official told ABC news that the bodies of 21 attackers were buried across the border in Mali. Additionally, the village elder of Tongo Tongo was arrested on the suspicion that he stalled the visiting American unit to buy time for the ambushers to arrive into position. The arrival of French jets that didn’t even fire their weapons may not seem very impressive, and the headline of a Washington Post story the day after the briefing stressed the hour-long delay. Anonymous sources quoted by The New York Times, NBC and ABC News on Oct. 24 all stated that the patrol had departed on a routine intelligence mission in which combat was not expected on Oct. 3, but were re-tasked mid-mission to act on new intelligence, either to capture or to obtain intel on a high-value target—possibly the head of Islamic State in Greater Sahara. Some U.S. media have cast the reliance on French air power as a weakness. However, there are 4,000 French military personnel in the arid sub-Saharan Sahel region serving as the backbone of Operation Barkhane, an effort to coordinate and assist Chad, Burkina Faso, Mali, Mauritania and Niger in their conflict with a hodgepodge of irredentist insurgent groups ranging from Al Qaeda-in-the-Islamic Maghreb, ISIS and Tuareg separatists to the vicious Boko Haram group that’s active in northern Nigeria—all of which have transited fluidly back and forth across national borders. There are major French bases are in N’Djamena in Chad, Niamey in Niger and Ouagadougou in Burkina Faso, with an additional forward base in Gao, Mali. French fighter jets, special operators and light mechanized units have engaged in numerous peacekeeping and combat operations, particularly in Mali, and sustained casualties from IEDs and ambushes. By contrast, the U.S. Africa Command—which muster around 5,000 troops for all of Africa—has played a lower-profile role, providing airlift and deploying Special Operations Forces to train allied military forces and assist in intelligence-gathering missions, all the while discretely building a sprawling spiderweb of clandestine bases across Africa from which it dispatches drones or civilian light aircraft on spy missions. The 800 U.S. troops in Niger were originally under orders only to accompany African troops on operations in which contact with enemy forces was unlikely. Because of U.S. military’s generally non-combat disposition in West Africa, it was inevitable they would need to call on the French for armed backup. A recent report by The Drive’s Joseph Trevithick notes that cooperation between French and American forces in West Africa, though substantial, may nonetheless occur on a relatively ad-hoc basis as the two nations pursue separate missions. The Mirage 2000 aircraft that responded to the Green Beret’s call for help entered service in 1984 as a fourth-generation successor to the famous delta-wing Mirage III and swept-wing F1, both of which saw action in air battles over the Middle East, Africa and South America. The Mirage 2000 model reverted to the triangular delta-wing configuration, trading lift and maneuverability for speed, allowing it to fly up Mach 2.2 powered by its single M53 turbofan engine. However, the new jet was also engineered to be aerodynamically unstable—it has no tail stabilizers—to improve maneuverability, and compensated for that by using then-new fly-by-wire technology to automatically stabilize the plane for the pilot. The result is a fast, highly agile fighter with excellent handling that could lug 14,000 pounds of munitions on nine pylons. The Mirage 2000’s characteristics at the time placed it in competition with the similarly agile F-16 Fighting Falcon. The lighter Mirage 2000 arguably has a modest edge in close air-to-air dogfighting performance, as it boasts a 10-percent-higher maximum speed and a superior instantaneous turn rate. However, the F-16 can still sustain turns better over time, and more importantly, is a multi-role design whereas early-model Mirages are less suitable for ground-attack missions. While the Mirage 2000 in in service with eight countries — notably including India, Yemen, Taiwan and Greece — the cheaper F-16 serves with 26. The Mirage 2000s of the French l’Armée de l’Air first saw action during the Gulf War flying air superiority patrols, as did Peruvian Mirages during a 1995 border conflict with Ecuador and Indian Mirages during the Kargil War. However, in none of these cases did the fighters shoot down enemy aircraft. Ironically, the only aerial victory a Mirage 2000 has scored was in an encounter between a Greek aircraft and a two-seat Turkish F-16D over the Aegean Sea in October 1996. However, as the Turkish pilot probably didn’t expect his Greek adversary to accidentally launch a Matra missile in what had previously been a series of tense but nonlethal aerial skirmishes—the Greek pilot insists he forgot the missile was armed for launch—it wouldn’t exactly qualify as a typical combat engagement. Instead, the Mirage 2000 staked out its legacy primarily in the ground-attack mission. They first released weapons in anger during the NATO intervention in Bosnia and later in Kosovo, though a man-portable surface-to-air missile shot down a 2000N model in 1995. Indian Air Forces Mirages of No. 7 squadron were hotwired to employ Paveway laser-guided bombs, and played a decisive role in knocking out Pakistani bunkers as high as 5,000 meter above sea level during the 1999 Kargil War while dodging Stinger missiles. Then between 2002 and 2011, French Mirage 2000Ds stationed first in Tajikistan and Kyrgizstan, and then forward deployed to Kandahar, provided air support for NATO troops in Afghanistan, using laser-guided bombs to destroy targets identified by friendly troops, as visible in the video below. The French Air Force currently operates three types of Mirage 2000 jet fighters across two bases in West Africa. In N’Djamena, the capital of Chad, there are two Mirage 2000D attack planes as well as two 2000Ns—a model originally intended to lug heavy ASMP nuclear cruise missiles, but which has had its role expanded to conventional attack, tactical recon and signals intelligence. Both are two-seat variants equipped with Antelope terrain-following radars for low-altitude operations, laser targeting systems and enhanced defensive countermeasure suites including jammers and warning receivers. However, neither type has cannons, which could be useful for strafing point targets close to friendly forces. Far to the west in the Nigerien capital of Niamay, there are two to four more Mirage 2000Ds as well as two of the basic single-seat Mirage 2000C-5 fighter variants equipped with two 30 millimeter revolver cannons, which have been modified to launch GBU-12 laser-guided bombs. The two types have often “buddied up” — the D-model aircraft painting targets with their laser designators for the C-model fighters to hit. The short-range fighters usually require tanker support from locally based KC-135FR refueling tankers. A short French Air Force documentary from 2015 depicts the deployment, daily life, and flight operations of the Mirage units in Niamey, which also serves as a major base for French and U.S. military drones. 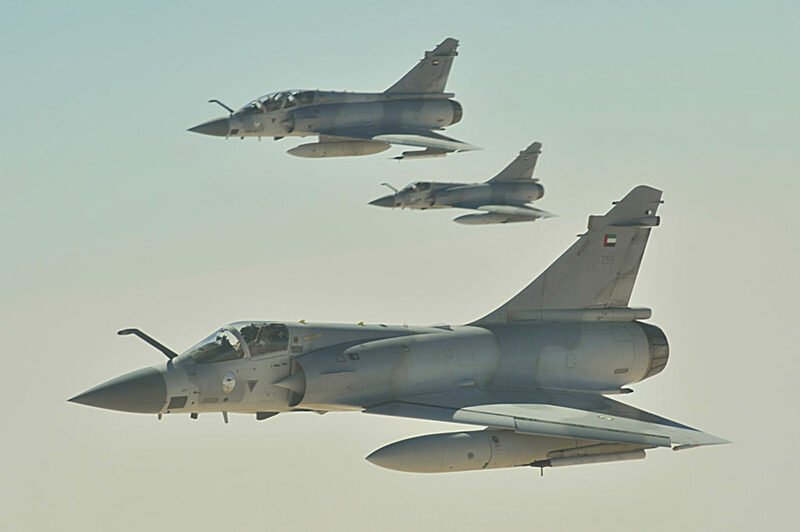 Six Mirage 2000Ds first entered action in the region on January 2013 as part of Operation Serval, serving alongside four newer Rafale fighters and two older Mirage F1s. At the time, a military coup had paralyzed the Malian government at the very moment that a Tuareg separatist rebellion hijacked by Islamic extremists overran the entire eastern half of the county, infamously leading to the destruction of ancient texts in the city of Timbuktu. A rebel army mounted on technicals was making a beeline for the capital of Bamako when the French fighter jets and helicopter gunships swooped into action in support of Malian troops, followed by French special forces and light armor on the ground. The counteroffensive halted and then completely rolled back the rebel advance. However, efforts to keep the peace afterward have suffered setbacks. The Mirages operating out of the Sahel have encountered their share of difficulties. In June 9, 2014, a 2000D crashed half-way between Gao and Niamey due to an unspecified “technical failure.” And on Sept. 28, 2017, a Mirage 2000N based in N’Djamena crashed during takeoff. In both cases, the crew successfully ejected. While cooperation between the countries in Operation Barkhane appears to have reduced the short-term likelihood of an incident such as the near collapse of Malian forces in 2013, the many factor that have caused insurgencies to fester in the Sahel region—which include not only political corruption and internal ethno-religious divisions, but also extra-regional conflicts in Libya and Nigeria—seem unlikely to vanish any time soon. As such, it’s possible Mirage 2000s will stay active over West Africa for some time to come.